AllegroMedical.com presents The Clif Builder's Cocoa Dipped Double Decker Crisp Bar - Vanilla Almond Meal Replacement Bar. High In Protein. No Trans Fat. 23 Vitamins & Minerals. 20g Protein Bar. The Protein Bar That Works As Hard As You Do. You're not done. You're a work in progress, building toward something big. That's why we made Clif Builder's - the great-tasting protein bar that makes every ingredient count- so you can get the most out of your workout. 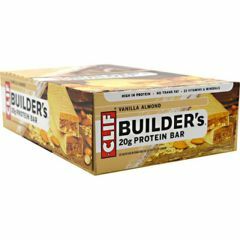 Builder's has 20g of complete protein, the vitamins and minerals you need to boost protein metabolism, and carbohydrates for sustained energy. Builder's never contains ingredients like artificial sweeteners, sugar alcohols or trans fats. Every Builder's ingredient serves a purpose, so it can best serve you- and all you're working toward. Gary, Founder and Owner of Clif Bar & Company. To assure best quality store in a cool, dry place. Allergen Statements: Contains soy and almonds. May contain traces of dairy, peanuts, wheat and other and tree nuts. We source ingredients that are not genetically engineered. May contain nutshell pieces.